Olathe East’s Muslim Student Association planned Hijab Day with the leadership club president, Hassan, and vice president, Khan. In the days leading up to the event, Hassan and Khan collected as many hijabs as they could find, receiving many donations along the way. When the moment came to set up their table they were more than prepared. Both students share they have often encountered their peers curiosity, but their classmates have been afraid to voice their confusion. Khan and Hassan expressed that they never want people to be afraid to approach them. In fact, the girls want people to ask them. To dispel such assumptions and encourage understanding, the two decided the best way to combat the issue was to create a safe, comfortable environment for people to voice their queries. With the help of their sponsor, English teacher Jessica Steinberg, and cooperation from the school, they were able to get their table and create Hijab Day. However, they didn’t stop there. Khan and Hassan took the extra step to share their experiences as well as their knowledge. With the support of teachers who agreed to participate, they offered students a chance to try on the hijabs they had collected. “We had a poster that said ‘Hijab Made Me Feel’ and then everyone would sign under it how [wearing it] made them feel,” said Hassan. People, Muslim or not, were given the opportunity to share their thoughts and newfound understanding of another culture. Spreading awareness is The Muslim Student Association’s main goal. “We get a lot of hate because of our religion and how it’s portrayed in the media,” said Hassan about their motivation to create Olathe East’s MSA. Hassan and Alagha were hit with a wave of inspiration and passion to start spreading cultural appreciation within the school. One year later and the club remains driven by the same purpose. Events like Hijab Day have given them the opportunity to start reaching the student body on a larger scale, but the two still have plenty more in store for the Hawks. The club meets every Thursday during seminar to have group discussions on the day’s topic, but despite common belief, the MSA opens itself to students of all race and religion. “We actually want more non-Muslims to come because that’s our mission,” said Hassan. The club isn’t only for those who practice Islam. Instead, it was assembled to encourage diversity and unity. “It’s definitely also a place for others to express their cultures,” Hassan said. The two plan to focus on finding ways to reach a wider range of people in the future. The club is still young and they have plenty they want to accomplish in the years to come, and the two hope to do so with the aid of those from all different backgrounds. Through the club, they intend to improve the school, as well as get to know other students. 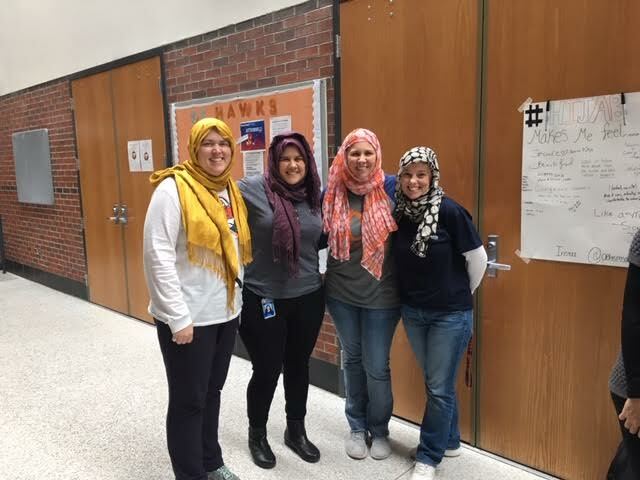 English Teachers, Rippee, Steinberg, Goddard, Tow participated in Hijab Day.